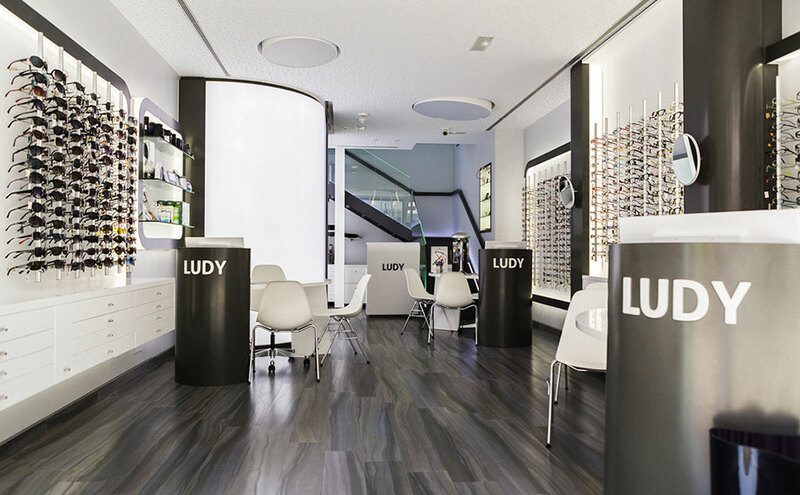 Forming part of “Multiopticas Ludy” in Santander, Multiopticas Ludy Torrelavega is found; an optician located at C/ Consolación, 14, one of the most emblematic places in the city. The establishment has two levels: on the lower floor we find the refraction area, optometry cabinet, and lens tester; and on the first floor the workshop. The refurbishment project of this optician’s has been undertaken by the Campa & Lamar interior design studio, also in charge of designing the furniture, giving the premises a new contemporary, aseptic and open image in this important Cantabrian city just 8km from the Cantabrian Sea, and 24km from Santander. We find the compact mineral from PORCELANOSA Group, KRION®, transformed by Transformaciones Cántabras De Madera (TCDM), who have a great knowledge of the material, in numerous spaces of the establishment. The fronts of the display units are made from 6906 Dark Grey, the sides are made with 4102 Extreme Light (translucent), and the drawers are covered vertically with 1100 Snow White. We also find KRION® in the hanging display units which look out to the exterior, service tables, worktops, and the spectacular dome made from 4102 Extreme Light which contains one of the examination rooms. Ultimately this is a project in which thanks to Campa & Lamar, Multiopticas Ludy and TCDM, KRION® forms an active and important part, and we are pleased with its eye-catching final result.